Occitanie or Occitania (Occitan: Occitània) is a warm and sunny region of southern France. This is a land of stark contrasts; whether it's the canal du Midi making its shady journey from rose city Toulouse along the sun-drenched Languedoc plain to the Mediterranean sea, the towering majesty of the Pyrenees, or the wild beauty of the Cévennes, the landscape, climate and atmosphere are never the same from place to place. Diverse too is the tourist situation: Carcassonne, the Pont du Gard and Lourdes pull in the crowds, and are among the most-visited sites in Europe. Elsewhere, you will come across many quiet, little-travelled spots, where traditional agricultural practices and folk traditions are maintained by bastide-dwelling locals who revel in enjoying and sharing the wealth of the land and sea - food and wine. Occitanie also has a rich heritage of art, poetry and architecture, and its history is turbulent and fascinating to anyone who cares to discover it, while its customs and cuisine blend very well with neighbouring Spain. Little-known and hugely underrated, this beautiful department is split between bastide-dominated pastoral lowland and Pyrenean highland, where the Cathars staged their heroic and grisly last stand. The hilly Corbières wine region, the fascinating but fraudulent walled city of Carcassonne, and the Mediterranean warmth of Narbonne, with its unfinished cathedral and protected natural coastline. The southern end of the Massif Central is home to daredevil mountain sports, rustic towns offering Michelin-starred local cuisine, and a modern engineering masterpiece in the Millau viaduct. Roman heritage writ large in stone: the golden aqueduct of the Pont du Gard, and the impressive temples and amphitheatre at Nîmes. Outdoorsy types will head into the Cévennes National Park. Agricultural zone that has bountiful fresh local produce for lovers of slow food. Drift on two or four wheels along country lanes between walled towns, through pretty, understated scenery. Bustling Toulouse is the main attraction here, but this department is also known for its waterways. Follow the Garonne into the Pyrenees, or else chug along the Canal du Midi in a narrowboat. The wild rooftop of the Pyrenees is a natural paradise of chilly lakes, dwindling glaciers and, of course, mountains. The Catholic pilgrimage site of Lourdes is also in this department. The longest and most commercialised stretch of the region's coast is also home to the youthful and energetic city of Montpellier, and the more traditional hilltop city of Béziers, and seaside resorts such as Sète and Palavas-les-Flots. Dominated by the rocky natural park of the Causses du Quercy, this department's towns seem to blend seamlessly with their surroundings, none more so than jumbled Cahors and fairytale Rocamadour. Another mountainous stretch of the Massif Central, whose thrilling highlight is the Cévennes National Park, a haven for rare animals (wolves, wild mouflon sheep and vultures) and those who long to see them. Otherwise known as "French Catalonia", this has many lovely river valleys winding into the mountains. The proudly Catalan city of Perpignan is just north of vineyards and historic ports hugging a rugged coast. Unfairly overlooked, but worth your time. If picture-perfect medieval towns and an almost-unheard-of wine region (Gaillac) don't grab, then maybe a surprising number of art museums will, dedicated to Goya, Toulouse-Lautrec and even chocolate art! Perhaps one of the most obscure departments in France, you won't be tripping over tourists here. All the better for enjoying its terracotta towns, wooded hillsides and charming villages in peace. 43.9280555555562.14583333333332 Albi — although it often looks like a film set from Game of Thrones, Albi's character is very much grounded in south-west France. Its UNESCO World Heritage listed old city is based around a fortified cathedral, and it serves as an excellent accommodation base for exploring the Tarn department. The painter and illustrator Henri de Toulouse-Lautrec was born here, and his legacy is ever-present. 43.3433333333333.21611111111113 Béziers — in the heart of Languedoc sits a hilltop warren of medieval streets that offer brilliant views over the landscape. All around, there are day trips to suit any taste, from beach days to vineyard tours and pouring over Roman relics in the dust. In August, travellers are drawn to the drama and spectacle of the feria (bullfighting festival), which as an arena bloodsport is in many ways a living Roman relic. 43.2158333333332.35138888888894 Carcassonne — this fortified medieval town is iconic in France. Though it is a genuine citadel from the 13th century with walkable ramparts and many period towers and rooms to explore, its distinctive fairytale look of conical roofs comes from a series of 'corrections' made by the 19th-century architect Eugène Viollet-le-Duc. These days, it's a little bit like Disneyland minus the mouse, but is nonetheless a must-see for anyone visiting the region. 43.6109194444443.87723055555565 Montpellier — second city of the region and another lively university town, with many fine old streets and landmarks to discover, including one of Europe's oldest botanical gardens. Mere minutes from the beach, Montpellier is Mediterranean in climate and feel, while the drinking and dining scenes are cosmopolitan and internationalist. 43.1847222222223.00361111111116 Narbonne — to the Romans, it was known as Narbo Martius, and today's archaeology buffs won't be disappointed with what they left behind, including the Via Domitia. Nor will the bulky (and forever unfinished!) cathedral and tightly-packed Medieval quarter let you down. For relaxation, a stroll along the canal, café on the square, or trip to the beach are at the top of any local's list. 43.8369444444444.367 Nîmes — probably the finest Roman remains outside Italy. The amphitheatre is second only to the Coliseum in terms of sheer splendour, while the Maison Carrée ("Square House") temple looks as though it hasn't aged in 2000 years. Even the local parks have statues and other ruins, while there is a trio of museums documenting different facets of the city's long life. 42.69752.89472222222228 Perpignan — a slice of Catalonia in France that has kept many of that nation's traditions - the Festa Sant Joan is a bigger deal than the Fête nationale, while paella is on more menus than cassoulet. Numerous narrow streets and squares make exploring the city's churches and monuments a real pleasure, while a trek up to the palace of the kings of Majorca is rewarded with panoramic views. 44.426236113.739263891 Cévennes — This national park is a fine area of chestnut-wooded low mountains, where the reintroduced griffon vulture can be seen soaring overhead, and where you might just hear the howling of wolves. To the west is France's only desertscape, while there is a great meteorological exhibition on Mont Aigoual. As well as natural wonders, there is plenty of human heritage - stone hamlets and traditional crafts and trades. Parc National des Pyrénées — Boasting a huge array of fauna and flora (including the critically-endangered brown bear), this national park will suit a wide range of visitors from climbers to naturalists, and is a perennial favourite among mountain bikers and skiers. The Pyrénées-Mont Perdu UNESCO world heritage site straddles the Franco-Spanish border, and the summit itself is in the neighbouring region of Aragon. Often called Occitania in English, the adminstrative region was created in 2016 by territorial reform from the smaller, but well-known regions of Languedoc-Roussillon and Midi-Pyrénées. Historically, these lands were Occitan-speaking rather than Francophone. Occitan, also known as the langue d'Oc / lenga d'òc, after the language's word for yes, had a distinctive literary culture in the late middle ages surrounding the troubadours of court. They performed lyrical poems about chivalry and courtly romances, and became fashionable across southwestern Europe. In religion, too, Occitans found a way to distinguish themselves, in Catharism. The Cathars were a Christian sect who believed in a dualistic God and were opposed to the perceived corruption of the Church in Rome. The movement attracted a powerful following among locals, who converted to "perfects", and lived austere, simple lives, shunning the eating of meat and all forms of killing. The Catholic Church branded them as heretics, and they were heavily persecuted and eventually massacred in their final stronghold of Montségur, Ariège. The extinction of the Cathars and end of the troubadour era (13th century) roughly signalled the start of an ever-growing influence of the Kingdom of France in this region, and started a long decline in the prestige of Occitania's culture and language. However, even today, Occitanie has distinguishing features. Despite the efforts of French governments over centuries to wipe out the Occitan language, it is still spoken in different dialect forms, and its literature and academic study have been enjoying a revival. Toulouse has the world's oldest literary society (Académie des Jeux Floraux), which is a dominant force in French and Occitan poetry. In contrast to most of France, where football is the main sport, Occitanie is a heartland for rugby, both union (rugby à XV) and league (rugby à XIII), while the pomp and festivities surrounding the controversial sport of bullfighting (tauromachie) can still be enjoyed in towns around the region. There are three distinct climate zones in the region. All along the coast, there is a Mediterranean climate, which is known for its dryness and its warmth, with long and hot summers and brief winters dominated by chilly winds and rain. This zone in particular is known to be expanding north and west due to climate change, and the region has suffered from an increase in forest fires. Further west on the plains and hills, the climate is cooler and influenced by the Atlantic, with more rain. The Pyrenees have a mountain climate, which is cooler still and characterised by much greater precipitation, including snow in the winter. Overall, Occitanie has a lot of sun, and is generally warmer than most parts of France, so barring any seasonal activities is good to visit any time of the year. French is the main language of Occitanie, though many people in rural areas have rather strong accents, influenced by the regional languages (see below). If you do speak French and have an appreciation for that sort of thing, there is a lot to like about the local accents chantants - "singing accents", describing the melodious rhythm to their speech and Mediterranean vowel sounds. In the main cities and tourist spots, you won't have trouble communicating with limited or no French, though basic politeness should prompt you to at least say "bonjour" before launching into English. In the countryside, knowledge of English is a lot more limited, and though there is a large resident British population, you shouldn't rely on them. So pick up a phrasebook, and start learning French! The language that used to be spoken in the whole south of France, called Occitan (or langue d'Oc), is still spoken in some villages and is actively promoted by some associations in the big cities. Catalan is also spoken in Pyrénées-Orientales, and on the border you may even encounter the occasional low-level resistance to speaking French (for instance having your "bonjour" rebuffed with a Catalan "bon dia"). In Occitanie you will often see bilingual French/Occitan (or Catalan) signs, including on information boards and street signs, and the announcements on the Toulouse metro are also given in Occitan! 43.5833333.9613881 Montpellier Méditerrannée. This airport has flights from a fair few European cities including Amsterdam (Schiphol), London (Heathrow and Gatwick) and Stockholm (Arlanda). Good links from the Maghreb, as well as domestic flights from the rest of France. 43.6351.3677782 Toulouse Blagnac. This airport has flights from most European cities including Berlin (Schönefeld), Birmingham, Bristol, Brussels, Frankfurt, Istanbul (Atatürk), Lisbon, London (Heathrow, Gatwick and Stansted), Manchester, Rome (Fiumicino), Warsaw (Chopin). Seasonal services from Montreal (Trudeau). Hub of low-cost airline easyJet. 43.3233333.3533333 Béziers Cap d'Agde. This airport is served primarily by Ryanair, including year-round from London (Luton and Stansted), and seasonal from Bristol, Edinburgh and Manchester. 43.2158332.3086114 Carcassonne. This airport is served mainly by Ryanair, including year-round from Charleroi, Dublin, London (Stansted) and Manchester, and seasonal from Cork, East Midlands and Glasgow (International). 43.75754.4163895 Nîmes. Served year-round Ryanair from Charleroi, Fez and London (Luton and Stansted), with seasonal from Liverpool (John Lennon). 43.38-0.4186116 Pau Pyrénées. chiefly domestic (Paris CDG/Orly, Lyon, Marseille, Nantes), with the only regular international service coming in from Marrakesh. 42.7405562.8705567 Perpignan. Year-round service only from Paris Orly and Charleroi, but a wider range of seasonal flights: Birmingham, Dublin, London (Stansted), Madrid (Barajas), Metz/Nancy, Southampton, Southend. 43.185-0.0019448 Tarbes-Lourdes-Pyrénées. Flown to year-round from Kraków (John Paul II), London (Stansted), Paris (Orly) and Rome (Ciampino). Seasonal flights come in from Beirut, Brussels, Maastricht/Aachen, Madrid (Barajás) and Rome (Fiumicino). France's brilliant TGV (train à grande vitesse - high speed train) network is only just starting to infiltrate the region, though the eastern parts are fortunate to be on the main route from France to Spain, so many Occitan cities have a TGV service even if the line speed is a little slow at present. As a consequence of this, Paris-Toulouse is France's busiest air route despite Toulouse not being even close to the second biggest city, simply because travel by train is comparatively slow due to the lack of LGVs. Carcassonne, Montpellier, Narbonne, Perpignan and Toulouse all have direct trains from Paris, Lyon, Marseille and Barcelona, as well as a range of other destinations, particularly around southern France (e.g. Bordeaux, Nice) and Spain (e.g. Madrid, Zaragoza). The best online source for ticket sales and journey information is the SNCF. As a starting point, count on 3.5 hours from Paris (Gare de Lyon) to Montpellier, 5½–7 hours from Paris (Gare Montparnasse / Gare d'Austerlitz) to Toulouse (Gare Matabiau), and about 3 hours from Barcelona (Estació Sants) to Montpellier. From Paris, it's 680 km to Toulouse, following the E9 European route (on road signs, these are green route numbers displayed alongside the red national route numbers), while the distance to Montpellier is 750 km, via the A10, A71 and A75 autoroutes (red route numbers). The A9 (E15) brings traffic in from the direction of Lyon, and then hugs the Mediterranean before crossing the Spanish border, and this is the way most traffic from Barcelona and the rest of Catalonia enters. Traffic from the east (Marseille, Nice and Italy), should come from the A8 via the A54. The A62 links Bordeaux to Toulouse, while the A64 brings traffic from the Basque Country and the rest of northern Spain. If you're driving from the United Kingdom or Ireland, count on 9-12 hours non-stop from Calais or Roscoff. It can be done in one long slog, but many people prefer to take an overnight stop or even a couple of days' rest halfway down the country, for instance in the Loire Valley. Occitanie's rail network is good value for money, and so extensive that it penetrates all but the most remote areas (such as the Cévennes). While the TGV and Intercités ply the region's long-distance routes, the backbone of the local system is provided by TER Occitanie. TER also operate the Train Jaune (Yellow Train), a tourist route which climbs from Vernet-les-Bains into the Pyrenees to a height of almost 1,600 metres. While a car is not necessary for most of the region, if you're planning on doing a lot of rural trips or touring with a caravan or campervan, Occitanie's roads should suit you. The vast majority are maintained to excellent standard, though streets in old towns and country lanes have the propensity to be narrow, which may take some getting used to if you're from the New World. Some remote mountain routes in the Pyrenees can be positively hairy, especially those that are unpaved and clinging to the edge of a steep drop, while maintaining a relentless gradient! The Canal du Midi runs for 241 km from Toulouse to the Étang de Thau near Sète, effectively linking the Atlantic Ocean (via the river Garonne) with the Mediterranean. Known for its distinctive plane tree-lined towpaths, the canal was built for transporting goods in the 17th century. Trade declined throughout the 20th century until ceasing operations in the 1970s. It was about this time the canal caught the attention of a group of eccentric British barge-lovers, who were already working on saving the United Kingdom's industrial canals for leisure purposes. Leisure boating finally started booming in the 1980s, and the canal is now very popular, especially among British, Dutch and German tourists. In 1996, it was inscribed on the UNESCO World Heritage list. Many towns along the route offer boat trips on the canal, and there are even restaurant boats which ply the waters. However, it also is possible to hire your own boat and cruise the entire length, which can be a relaxing week's journey. Major boat hire companies along the Canal du Midi include European Waterways, Le Boat and Locaboat. The charm of Occitanie is captured in hundreds of villages, each with a unique character. Predominantly a wine-growing region, this is in fact the most productive viticultural area in France; expect to see many hectares of vineyard stretching ahead of you! Many villages are famous for excellent individual wines. Bastides are a particular sort of medieval town built during the 12th and 13th centuries. They are generally walled towns built from local stone along a grid plan of streets (unusual for the European Middle Ages), with a central market square, which is often covered. Many of Occitanie's towns and villages are considered bastides. Côte Vermeille (Vermillion Coast) — the southernmost stretch of coast in mainland France is 20 km of beaches, coves and cute harbour towns. The Grotto at Lourdes — where the spirit of the Virgin Mary allegedly appeared eleven times to a young girl, who became Saint Bernadette. Now one of the major Catholic pilgrimage sites in the world, second perhaps only to the Vatican itself; expect crowds. Mountains — the Pyrenees are second in height only to the Alps in all of western Europe, and in this region run west to east through Hautes-Pyrénées, Haute-Garonne, Ariège and Pyrénées-Orientales. Generally, the mountains' highest peaks mark the border with Spain and Andorra. The Massif Central is a lower range that dominates Occitanie with rocky, almost arid landscapes, as well as forests. It runs north to south through Lot, Aveyron, Lozère, Gard, Tarn, Hérault and Aude. Roman ruins in Occitanie are many and varied, and can be found all over the place. That said, the most intact (and most famous) are all in the Gard. Mountain sports — the Pyrenees are obviously great for climbing and mountain biking, but they also have a ski season in the winter, with quite a few resorts, especially in Ariège and Hautes-Pyrénées. Hiking, paragliding, kayaking and canoeing are practiced in the Cévennes. Kayaking the Gard river is an original way to see the Pont du Gard. The Cèze is a quiet river ideal for a family trip. Windsurfing — Gruissan, about 10 km away from Narbonne on the coast, offers both sea and lake windsurfing options. Overall, this coast is a hotbed of windsurfing opportunities. Hike the GR 10 — starting on the Mediterranean at Banyuls-sur-Mer in Pyrénées-Orientales, and climbing swiftly into the mountains. If you have a spare 7 weeks, you can walk all the way to the Atlantic, though most will only do a section. Despite being a long-distance trail that runs the length of the Pyrenees, much of the route is accessible for much shorter walks that can be completed in a few hours. Occitanie is a great place to start the Way of Saint James. Cross the Pyrenees, then hike across northern Spain to Santiago de Compostela. The region's gastronomy is as diverse as its landscapes. Broadly speaking, the western half (corresponding to the old Midi-Pyrénées) has a typical south-western French cuisine, while closer to the sea (the former Languedoc-Roussillon) tastes are more Mediterranean. Cassoulet, a slow-cooked casserole dish that includes sausage, goose or duck, pork skin, and white beans. The Cassoulet triangle is between the three towns of Carcassonne, Castelnaudary and Toulouse. Magret de canard, a very tender cut of duck breast pan-seared, usually rare. Agriade saint-gilloise, a hearty stew mixing choice cuts of beef with anchovies, capers, gherkins, garlic and Mediterranean herbs. Brandade de morue: cod and milk come together with plenty of herbs and lemon to create a dish that's popular all over eastern Occitania and as far afield as Catalonia and Liguria. Soupe de poisson à la sétoise, a fish soup named after Sète, and cooked with vegetables in white wine and olive oil. Into Roussillon (Pyrénées-Orientales), the food becomes characteristically Catalan. Expect tomato bread, rice dishes such as paella, chicken, rabbit and plenty of alioli! Anywhere along the coast is also good for olives, and many towns have their own preferred varieties and methods of stuffing and cooking them. Much like the rest of France, everywhere you go will have its own bread, pâté, charcuterie and cheese specialities, and available varieties vary widely. More famous examples of the latter include bleu des Causses, cantal, pélardon (and indeed many different goat's cheeses) and roquefort. It's safe to say that this is a meat and fish eater's paradise, and indeed on most plates vegetables are a bit of an endangered species. Even local salads tend to be on the meaty side of things! Vegetarian and vegan travellers will have an even harder time finding decent restaurant fare than elsewhere in France. However, you shouldn't have too much trouble finding suitable restaurants in the larger student cities, particularly Montpellier and Toulouse, and the Mediterranean cuisine is much more vegetarian-friendly in general. Aside from restaurants, a trip to any local market will see you inundated with a bewildering variety of fruits and vegetables, as well as so much meat, bread and cheese produce; cooking for yourself will become a very tempting prospect. Meet the biggest wine field in Europe... in this region, vineyards are everywhere. The passion and traditions that go into making wine reflect the region's history and culture. In the Languedoc especially, the long, sunny summers and brief, windy winters combine to make the land perfectly suited for viticulture. All this being said, the wine of this region is considerably less well-known than others; there are certainly no 'big names' in the manner of Burgundy or Bordeaux. You can still find local wine of exceptional quality however, especially reds and rosés. Some regional highlights are Gaillac, Corbières and Gard. Fitou is a red which makes a good accompaniment to the meaty cuisine of the region. Picpoul de pinet is a white that goes perfectly with seafood. For those with less discerning palates who still want to support the local economy, look for anything with Vin de Pays d'Oc on the label. As well as wine, Occitanie has a tradition of distilling liquor. Cartagène is a grape-based spirit which is a typical apéritif, though it is also recommended for consumption with foie gras and roquefort, both delicacies of the region. Other spirits include mint liqueur brand Get 27 and Noilly Prat, a type of vermouth. The Gard department is home to Perrier, the naturally carbonated mineral water. These days, the enterprise has been absorbed into the controversial Nestlé Waters conglomerate, but the water is still bottled at source locally. The region's best nightlife can be found in the two large cities, Montpellier and Toulouse. Many towns in the Mediterranean area have a fairly lively summer scene as well, and indeed most Occitan towns come to life in a big way during the summer holidays. The region is popular with tourists, so the accommodation base is extensive and even small towns usually have at least one hotel and a variety of B&B (chambres d'hôte) and self-catering options (gîtes). There are lots of campsites too, in keeping with the rest of the country. The only place you're guaranteed to see a bear - the zoo. Pickpockets operate in all of the major tourist destinations and larger cities in this area of France. Be vigilant of your surroundings and keep your belongings out of sight and tucked away safely. Forest fires are common in late summer, especially August and September. The local authorities are very well geared-up to deal with fires, and so the risk is minimal as long as you are sensible. If you see a forest fire (or more likely its smoke), and haven't been evacuated you are most likely safe where you are, but it is still beneficial to keep abreast of the local news during this time. This can be difficult without a knowledge of French, so if in doubt ask an English-speaking local. In the remote Pyrenees and Cévennes, there are small numbers of wild animals (wolves and brown bear) with the potential to harm humans, though attacks on people are unheard of in the 21st century. 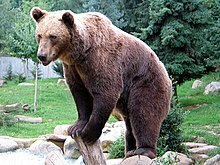 Both creatures are very elusive and keep out of the way of people; European brown bears in particular are much warier of humans than their American cousins, and due to their rarity your chances of seeing either animal in the wild are sadly very low. If you do have an encounter, the best thing to do is to retreat slowly and calmly to a safe distance with your gaze averted (staring eyes are the mark of a predator), perhaps while speaking in soft, non-threatening tones. Pyrenean folklore recommends humans politely pass the time of day with any bear they meet before withdrawing, to avoid offending and thus angering the bear into an attack. Another excellent reason to master conversational French! For more practical information, see Wikivoyage's guide to dealing with bear encounters. Auvergne-Rhône-Alpes — the northern part of the Massif Central range is a paradise for walkers. The industrial city of Clermont-Ferrand is ringed by extinct volcanoes, while cosmopolitan gastronomic Lyon sits at the head of the Rhone Valley. Nouvelle-Aquitaine — as characteristically south-western as Occitanie, highlights of this large region include the French Basque Country, the Dordogne valley, and the city and wine region of Bordeaux. Provence-Alpes-Côte d'Azur — France's sunny second city Marseille is just the start. PACA's boundless charms are encapsulated by Camargue cowboys, Riviera chic, Alpine glitz and Provence's iconic lavender fields, pétanque courts, perfumeries and markets. Andorra — the Pyrenean mountain microstate is the only country with Catalan as an official language. Its main interest to travellers is its spectacular vistas and its tax haven status; people from Occitanie go there for cheap booze and ciggies. Aragon — a largely empty Spanish land that has perfected the art of mixing desolate landscapes with clever architecture. Don't miss its hugely underrated capital, Zaragoza, where 2000 years of heritage await you. Catalonia — stubbornly independentist it may be, Catalonia is still for now part of Spain. While you would be as mad as Salvador Dalí to miss out Barcelona, Catalunya's loveliness is typified by the wonderfully rugged Costa Brava and Romanesque mountain towns. The Way of St James starts in the Pyrenees, and continues all the way through northern Spain to Santiago de Compostela. This region travel guide to Occitanie is an outline and may need more content. It has a template, but there is not enough information present. If there are Cities and Other destinations listed, they may not all be at usable status or there may not be a valid regional structure and a "Get in" section describing all of the typical ways to get here. Please plunge forward and help it grow! This travel guide page was last edited at 08:54, on 17 January 2019 by Wikivoyage user ThunderingTyphoons!. Based on work by Wikivoyage users Ground Zero, LPfi, Wrh2Bot, AndreeBot, Mx. Granger, Ibaman and Traveler100bot, Wikivoyage anonymous users 136.206.245.46 and 206.82.29.62 and others.